well, it's a pretty slew of mistakes. displayed on eggshell silk no less. 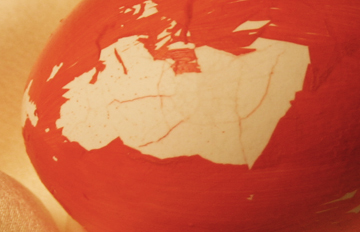 I wanted to etch a painted unshelled hard boiled egg. so I painted one. orange. did it in 3 parts since I didn't want fingerprints in the paint. took a day. 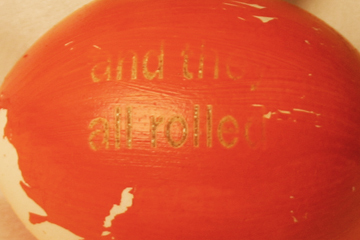 then it took about 5 days to get it together with the laser. after a few days I put it in a small plastic container and stored it in the fridge. when I pulled it out to place it on the laser table, I noticed it was kinda slimy. but with no cracks. was hard boiledness oozing out through the shell? had the paint dissolved something? I washed it off ... a bit too much ... and the acrylic paint started to come off. I stopped and preserved as much paint as I could, drying it with a paper towel and gentle pressure. I was going to have it tell a story, rolling it 15 degrees between line etchings. then decided to just see how it went with three lines of text in a one inch square. 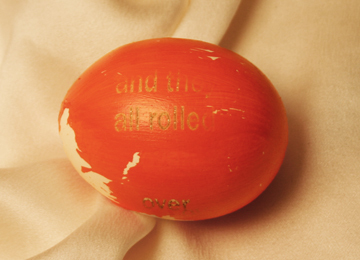 it's kinda bearing out the message "and they / all rolled / over" but the "over" way at the bottom of the egg was a subsequent run. the "over" from this run was right under the "all rolled" that you can see and was barely visible in my original higher res image. I often get the question about how an etching will come out on a curved surface. well, here's your answer. for an eggshell. painted with acrylics. ok, it's a grade A large egg. but I don't know the specs on curvature variances allowed per grade. I think acrylic would do a bit better. but not glass. or coated metal (edge of laptop). you just gotta try it. 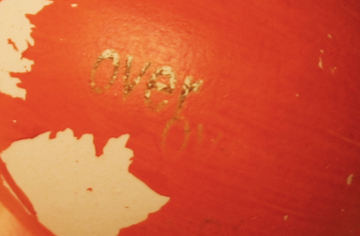 at left - you can see that sometimes it burns all the paint away, sometimes it leaves the paint burnt, sometimes it barely marks the paint. this was all during curvature etch testing, which, if it really mattered, I'd have to have a better setup than this to measure what I did so I could explain it and pass it on. the cracks are orange. 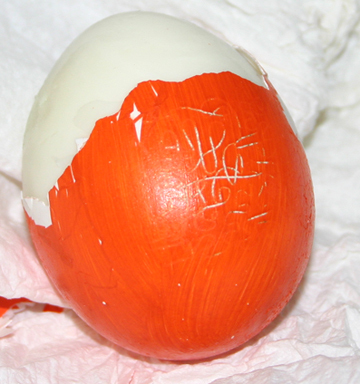 but the orange paint didn't penetrate the thin membrane around the egg itself. as I was peeling, I realized I'd forgotten all about this curve that I'd cut with cold vector settings. shows promise for future trials. if only I could get that jig to work to spin it on the rotary attachment. This page contains a single entry by laura published on July 30, 2009 3:48 PM. was looking up car info I swear was the previous entry in this blog. laser fractured glass is the next entry in this blog.